Every year as part of the Miss America organization, one USD student is crowned as Miss USD. This year, Anna Bonnstetter, a junior strategic communications major, won the title. Bonnstetter said her first time ever competing in a pageant was last year during the Miss USD pageant. This Miss USD pageant is considered a local pageant within the Miss America organization. Winners of the local pageants in South Dakota will then compete in the Miss South Dakota pageant on May 30 – June 1. “I’m excited to represent USD at Miss South Dakota and get the opportunity to go to events for USD and promote the pageant,” Bonnstetter said. 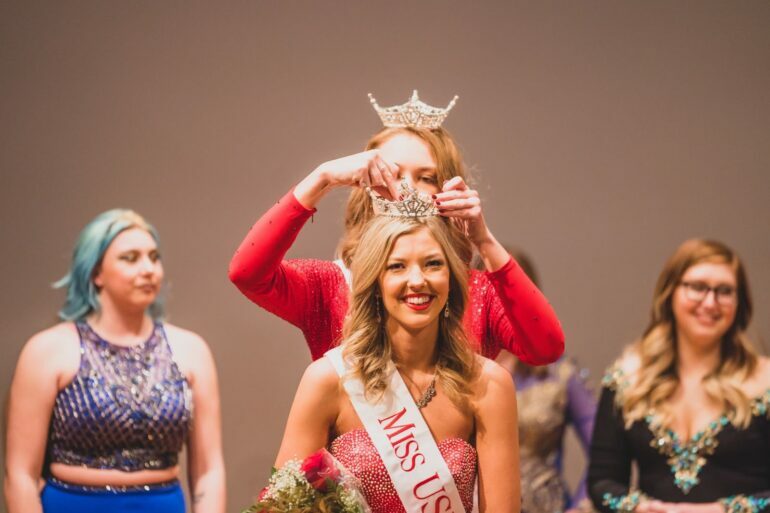 Carrie Wintle, current Miss South Dakota and organizer of the Miss USD pageant, said they had nine contestants in the Miss USD pageant this year. Four of those contestants won a title. Miss USD was one of them, and they also gave Miss Missouri Valley to Sylvie Larson, Miss Clay County to Baylee Dittman and Miss Missouri Valley Outstanding Teen to Kate Dailey. In order to compete in a local Miss America pageant, candidates must fill out paperwork that help the judges get to know them. Candidates must also raise money for the Children’s Miracle Network. “The Miss America organization also partners with the Children’s Miracle Network so in order to compete at local competitions, you have to raise a little bit of money for Children’s Miracle Network,” Wintle said. Bonnstetter said she had to raise $100 to compete for Miss USD. She said she will have to raise more money for the Children’s Miracle Network so she can compete in Miss South Dakota. Bonnstetter said everyone in the pageants also gets to choose a platform to focus on. As for Bonnstetter’s responsibilities as Miss USD, Wintle said she’ll have to help organize next year’s Miss USD pageant, compete in the Miss South Dakota pageant and just be an overall ambassador for USD. One thing that both Bonnstetter and Wintle want people to understand about Miss America is that it’s a scholarship pageant. Every year the University of South Dakota Foundation gives a $1,000 scholarship to Miss USD. Bonnstetter said to be in a pageant, all you need is something you’re passionate about and confidence. Lauren Soulek is a junior from Delmont, South Dakota studying Media/Journalism and International Studies at the University of South Dakota.